MiPet is the exclusive range of products developed by our vets for our client’s pets within the CVS group. MiPet products have been developed in conjunction with and with the full approval of the Clinical Advisory Committee – who are a group of our veterinary surgeons within CVS who make all our clinical decisions on current and new products first, before the commercial aspect is considered. 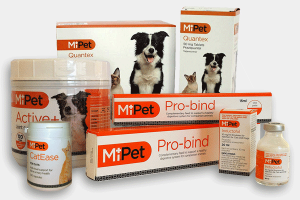 MiPet is range of high quality and technically advanced products that can help manage certain conditions or treat acute or chronic illnesses or in some cases help keep our client’s pets in tip top condition. By buying direct from the manufacturer we can buy at a better cost price and savings are also passed on to CVS clients meaning the MiPet products are between 10-30% less expensive than the branded version. We have nutritional supplements, prescription only medicines, pet accessories and later this year life stage pet food in the MiPet ever expanding range of products.